When the north wind doth blow, then we shall have - - not snow - - but the last couple of races in the Dell Quay Frostbite Series. Once again, a handful of intrepid sailors braved the strong north easterly winds to experience the exhilaration that such strong winds can bring, with times of heart stopping acceleration, despite these highs being dampened at times by the inevitable capsize. Four of the five competitors ended up in the sea at some time during the afternoon. The first race involved two groupings. The two fast RS400’s of Peter King and Rob Corfield battled together. King quickly established a strong lead as the other RS400 was over-powered by a strong gust, only to recover much of the lost ground when King’s boat suffered a similar fate. At the other end of the fleet Ken Baker in his Day boat was doing battle with the Solo of Carol Andrews, swapping positions in the tricky sailing conditions. Were the screams heard by folk standing on the end of Dell Quay screams of delight or of sheer terror, as the helms struggled to keep their boat upright? Andy Morley, sailing more sedately in his Pico, was spotted surfing on the down-wind legs. Surely, that is not something expected from a Pico? 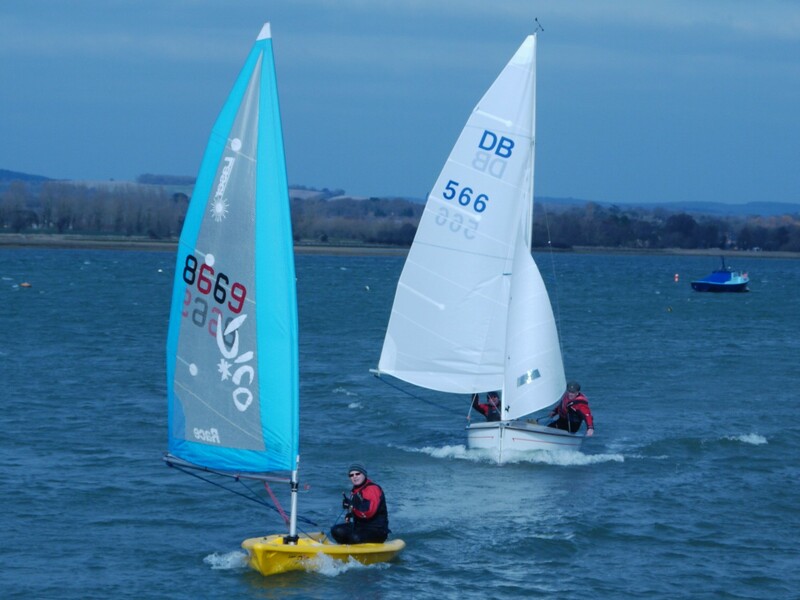 Once again, on handicap he took first place, followed by Baker’s Day Boat and King coming third in his RS400. The second race turned out to be a simpler affair between Rob Corfield in his RS400 and Ken Baker in his Day Boat, the others having fallen by the wayside. The Day Boat triumphed, leaving Corfield to make do with second place. The outcome of these final two races means that in the 12 race series overall, first place goes to Bill Dawber (Solo), second to Andy Morley (Pico) and third to Ken Baker (Day Boat). All in all, this has been an excellent Frostbite Series with competitors deserving congratulations for participating in conditions which often proved to be very challenging. Dell Quay starts its 2016 racing season with the first of the Early Helm races, commencing at 12:30 pm on the 12th March.